Earn $18.71 in Rewards credit. Click to learn more. Skip the set-up and get wrenching. 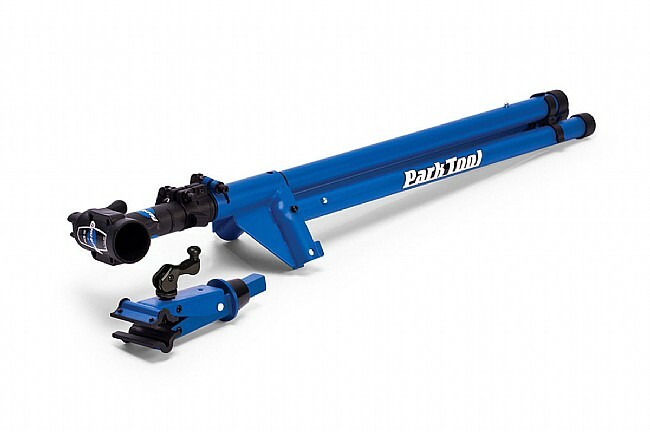 The Park Tool PCS-10 Home Mechanic Repair Stand is an easy to use repair stand that makes home repairs a piece of cake. The cam-type clamp allows single action clamping of tubes 7/8" to 3" (24mm to 76mm), with fully-adjustable clamping pressure and replaceable jaw covers. The composite top tube allows smooth 360-degree clamp rotation. Quick release height adjustment (39"-57", 99cm-145cm) puts your bike right where you need it. When you're done, the stand folds up to 41" for storage and portability. The three-point leg system with reinforced center yoke provides superior stability. Well worth the money. Great for working on any aspect of your bike. I have a carbon fiber bike and it is no problem to use this with it. This stand is solidly built but still folds for storage. Adjustable height and grip work well holding the height but the QR tightening mechanism when fully tightened (at least that I can get) will still allow some rotation, which is why I deducted a star. That said, I believe it's a great value and the best in that price range. Use it to repair bike that I use for commuting and I like everything about it. Easy to set up and store away for next time. I have a couple friends that have this stand. Been riding MTB for 29 years. Been reluctant to spend the $$ for a new workstand. I really like the compatibilityfit for our different frames and functions (such as height adjustments). If your 65 or 5 tall youll love this thing. Quality is excellent and I really like how the stand folds up for a small footprint. Very easy to use and would highly recommend this product as a buy. I used feedback brand and I like this and the quality better. Good Riding! Great design, quality build, stable and easy to use. I use my PCS 10 after most rides for cleaning and light maintenance. The clamp is very easy to use and no risk of damaging my carbon seat post. Well made and very sturdy. This stand has great clamps and supports the bike in any position. What an improvement for working on the bike! I was concerned with the bike stand being sterdy , no problem very sterdy. I love this product and use it with all kind of bikes mountain BMX and road bikes. I would recommend to anyone. This stand makes propping up the bike against the wall so outdated. Being able to work on the bike in every possible orientation is unbelievably useful. I am rebuilding an old frame with new 11 spd. campy and have found the stand to be indespensible and easy to use. Plus it is easy to get out and put up. Fantastic value. Fully adjustable height, angle. Quick release clamp for quick mounting and unmounting. Wish I had bought this a long time ago. I now lube my chain much more frequently (as I should) because it is so easy to do. Works as advertised, used it to replace a chain and it was so much easier than turning the bike upside down. Its heavy and bulky and not really that portable, but I don't intend on taking it anywhere. It folds up for storage in the garage. The PCS-10 is a solidly built stand. It hold s both round and aero seatposts securely. Very cumbersome to put up and take down. Stable with bike in stand and clamp is adjustable. This stand is perfect for the home mechanic. 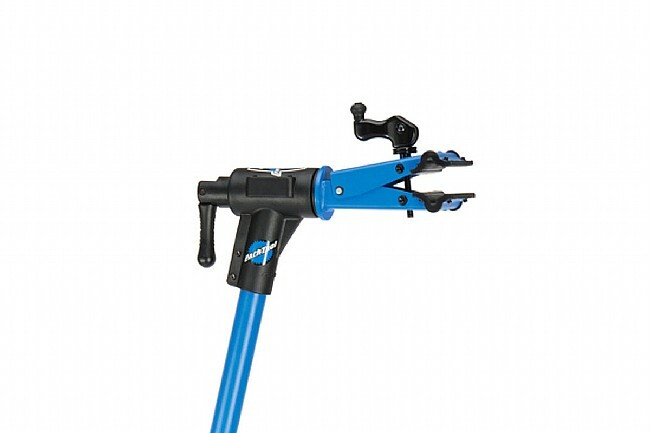 It is very stable for wrenching despite being very quick and easy to set-up. Works great for bike cleaning and regular maintenance as well - using the stand ensure the bike doesn't tip over while working on the bike as opposed to just leaning it against something. Makes cleaning much easier as the bike can be raised and/or rotated to make reaching hard to clean areas easier. It sets up easily and easily takes down for storage. It holds my bike very securely in all rotational positions when clamped down. The quick-releasequick-clamp head is a great feature of this stand. It holds my bike very stable when working on it. Great stand, Easy to use. Very easy set-up out of the box. Works great on the aero carbon seatposts of the bikes we own. Very stable. Ability to rotate bike into various position for cleaning andor working. Folds up quick and easy for storage. The Park PCS-10 is a great tool to have around your garage to work and clean your bikes. I use this at least 3 to 4 times a week to work and clean our bikes after every ride. This has made working on the bikes much easier and allows you to set the bike up to work on in almost any position. This is a tool I wish I had purchsed much sooner. You get what you pay for. Park Tools are great. I replaced one of those cheapie units from one of those discount warehouses with the Park Tools unit. Heavy Duty, Easy to Use and highly functional. You want the best? Then you're going to have to pay for the best. Well worth the money on this stand! I needed a stand to work on my mountain bike, I knew Parks products are good, but, didn't know which one to go with . . .
makes working on my bike a joy! I don't think I will never need another work stand! Great balance of value and quality. 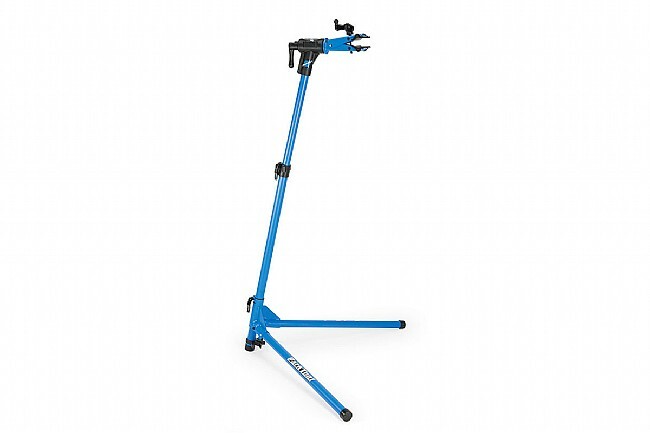 This bike stand provides the sturdiness of a professional stand at a more responsible price for someone who is only maintaining their own bikes.